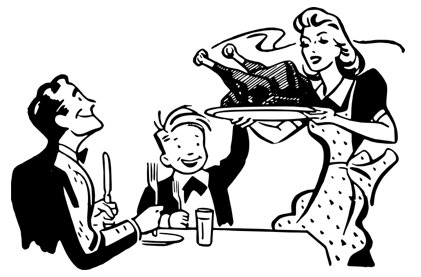 What is reasonable to expect of little kids at the extended-family dinner? For my four boys, a favourite activity is sliding off their chairs and disappearing under the table briefly, only to suddenly reappear on their seats again. Sitting across from them, they look like a pack of gophers popping in and out of their burrows. NOT what dinner looks like at our house! Due to this tendency, I usually allow my boys to leave the table between courses, so that they can play, away from the eating and conversing adults. Last year, my laxity produced a few critical comments from grandparents and some great-uncles and aunts: "They need to learn to sit still and eat together as a family!" I certainly agree: kids can --and should-- learn to participate appropriately in various social scenarios, including siting for the duration of a meal, waiting to be served and enjoying conversation with others. However, I also think we adults need to be realistic about how and when that will happen. I really want a piece of that pie Mom and I made together. So yummy! It's my favourite. When's dessert coming? Arrrgh, Uncle Somebody is asking me a bunch of questions. Things about school... I don't remember --I haven't been to school for days and days! Why doesn't he ask me about something cool, like the new truck I got? Wait, did I leave it in the other room? I can hardly wait to play with Cousin Jay with it... Is it time for dessert yet? Seriously, can you say this is a four-year-old's ideal fun-time? So, yes, let's help our children learn the rules of social gatherings and the art of conversation. But, for heaven's sake, let's be realistic and do it in such a way that takes into account who our kids are and where they're at. Relax, all you relatives! They'll get there. Glad to see you posting again!! My philosophy has always been mummy wants to enjoy dinner too so if the kids are finished and the adults are not , they may ask to be excused!